Billie Wayne Broussard was born and raised in Abbeville, La., to Mr. and Mrs. Eustis Broussard. She has a younger brother, J.E. "Spanky" Broussard, of Metairie, La. She has lived in Abbeville, La. her entire life. After graduating from Abbeville High School in Abbeville, La., Broussard attended Southwestern Louisiana Institute in nearby Lafayette, La. While there, she held a campus job working in the switch board office. Her major was English with a minor in Library Science. She graduated in three years. Billie's teaching career took her to Abbeville, Maurice and Henry High Schools. She taught English and was also a librarian. She was the librarian at Maurice Elementary for three years until her retirement. During her teaching career, she was involved with and enjoyed her affiliation with the Louisiana Librarians Association and made many friends. 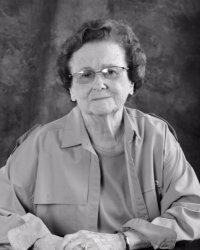 She retired from the Vermilion Parish School system in 1990. Broussard also enjoyed participating in the La Famille Beausoleil Broussard organization. Broussard was married to R. F. Broussard until his death in January of 2001, and has one daughter, three sons and eight grandchildren.